Hey there friends! I was tagged by Emirati Mama for this blogging interview. The purpose is to discover why and how bloggers blog so here goes nothing! Well, I started keeping a journal when I was pregnant. I basically wrote about how my pregnancy was going or letters to my son. After he was born, it was quite difficult to find the time to sit down and write by hand. I’m a pretty fast typer and after discovering some really great mommy blogs on instagram I just thought I’d start my own and see how it went! Overall, I don’t think the content has really changed. I still blog about my son and my day to day activities but I tend to play around with the look of my blog. I still don’t feel like I’m 100% sold on the theme of it. When I have the time, I’m usually trying out different themes to see which I like best. Well, at the moment I don’t have one. I’m still getting the hang of blogging here so maybe that’s the next step for me? I’m the type of person who needs a lot of information before doing something. I like to know all the facts before I can give my honest opinion on something. I’m very open to any new opportunities that may come my way but before I get involved, I need to make sure I’m supporting something that I truly believe in. What person would I be if I didn’t really care for what I sponsored or endorsed? I’m always interested in learning more about this side of the blogging world. Just to continue to blog for now! It’s very therapeutic for me to write down my rambling thoughts so that’s where I’m at at this current moment! I’d be lying if I said I didn’t care at all about them. There are some days where I look at rankings and statistics and think “Great. No one is reading today…” but then I remind myself that I didn’t start blogging for other people. I started my blog for me and me alone and at the end of the day, that’s all that matters! There you have it! 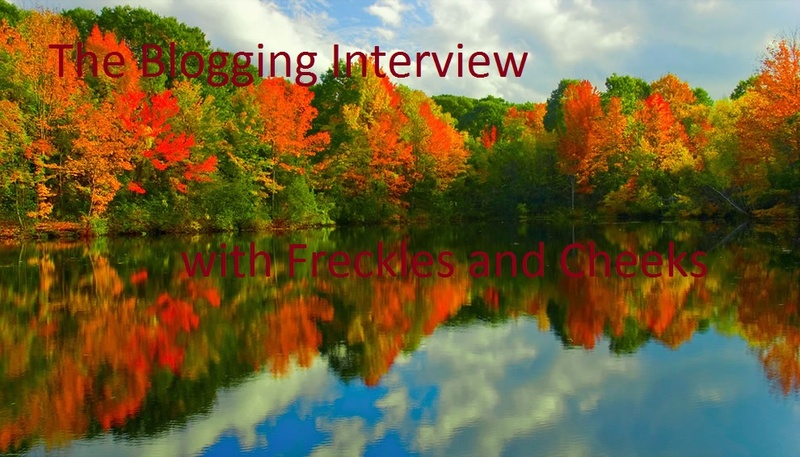 The Blogging Interview with Freckles and Cheeks! I enjoyed reading your answers 😀 and I LOVED the photo you have displayed of the trees. Such beauty. I also started writing “just for me”. I think writing a blog is so therapeutic. Thanks for the nomination!